All too often, roofers don’t install metal edging or roof drip edges. These corner-shaped metal strips are left completely out of many roofing bids, even though most shingle roof manufacturers recommend them and include instructions on how to install the edges in the manuals that come with their roofing products. Roof drip edges perform a very important function. They collect water from the roof and allow it to run off via the edging rather than down the fascia or the siding of the house. Many times roof shingles are installed to extend from 3/4” to 1” past the edge of the roof. Without a roof drip edge, these shingles are subject to bending and cracking. If the integrity of those shingles is compromised and no metal edging is present, it’s possible for water to run down the edge of the shingle and back up underneath, which can result in damage to the roof deck. Roof drip edges are particularly important along the eaves, where most of the water will run off. They’re also important along with rake edges of the roof, although not as important in this location since water typically runs parallel to the rake edges. 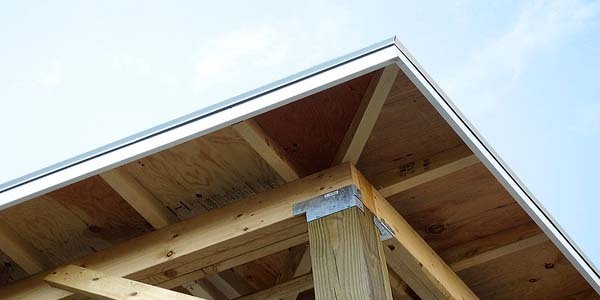 The drip edge can go either on top or below the roofing felt and over the fascia. If you’re in the process of getting bids for a new roof, be sure to ask prospective roofing contractors about roof drip edges. Remember the important role they play in making sure that your new roof lasts for many years to come.